Yvonne "Johnny" Gurr (nee Johnson) is a woman with a pioneering spirit who settled at Yatco in early 1960 and went on to become editor of the Loxton News, the ABC's first female regional journalist based at Renmark, a noted journalist, author, and historian. 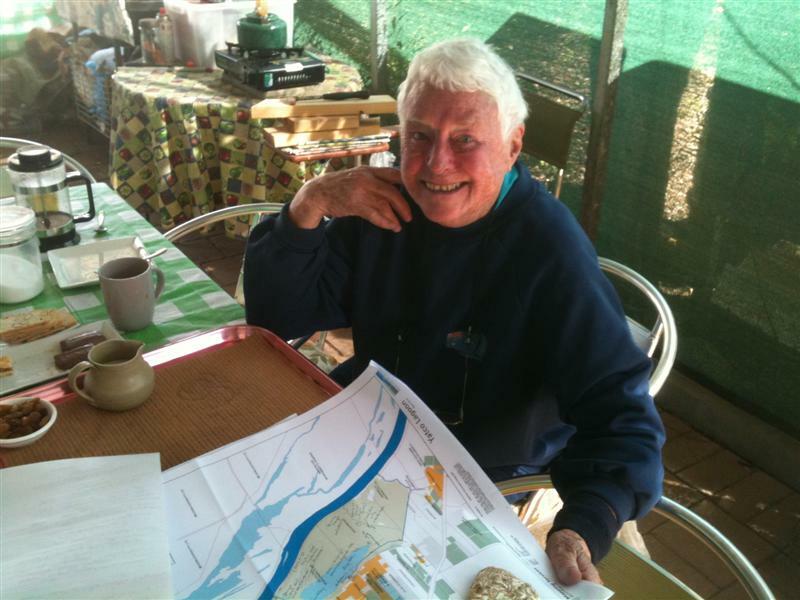 Johnny was an Adelaide born girl with a couple of world trips under her belt whose first introduction to the Murray and New Residence was in 1954 when she and Mal Gurr visited his original fruit property. When this and other properties were threatened by the 1956 flood she drove around the mid north collecting wheat bags for use as , owner of the Moorook store and a local carrier--brother of Paul Kassulke--would drive his truck down and collect them. The owners of the parking station were not happy and protested at the wheat bags taking up valuable parking space, but Johnny convinced them that this was a crisis. Johnny and Mal Gurr purchased a piece of Paul Kassulke's farmland and established their fruit block, growing catch crops (crops to catch early and opportunistic markets) such as peas, tomatoes, water melons, rock melons, and trombones in season to give some sort of income until the apricots, peaches and citrus started bearing. Johnny cut apricots for other growers, and ploughed Paul's farming acres to get some sort of pocket money. Fishing on the river was popular and many cod and callop were caught around Nynes Island from a small bond wood dinghy built by Johnny and Mal. When sailing on the lagoons in the 1960’s she recalled hitting the original fence posts placed across the lagoon. On her arrival at the piece of land in 1960 Johnny's first job was to dig the channel that links the river and the southern end of Yatco Lagoon from which irrigators have sourced water since late 1960 But in January 1960 she drove their old international tractor with an even older scoop attached to dig that channel from the creek to the front of their property (now Schober’s property). It took six weeks, the task enormous, as she bogged the tractor many times when the mud filled the treads and the wheels spun. It was not deep enough, and they hired the services of top gun operator Gordon Hoffmann (developer of Hoffmann Engineers) using specialised heavy equipment. He took a week doing what had taken Johnny six weeks to do. Johnny’s determination came from the need to supply water to a 33 acre fruit property that she and Mal started developing overlooking the southern end of Yatco Lagoon. As soon as the channel was completed others quickly took advantage of the situation without necessarily contributing to the costs. There was no public consultation involved in digging the channel--just neighbourly talks and strong support from landowner Paul Kassulke. As the channel reached its completion the "well 'had to be dug for the suction line from the pump. Mal marked it out, started digging, then handed this job over to Johnny while he hauled up buckets of spoil to the top. Mal put an old buggy wheel at the bottom of the well and lined the sides with galvanised iron to give a nice circular finish. They mixed and poured concrete between the walls and the galvanised iron, and wondered why they were using so much wet concrete. An examination showed that the well wasn't quite as deep as they'd hoped. The concrete had crept up on the outside of the iron, filling the bottom. In days to come, if anyone excavates this, they will find a buggy wheel, set in concrete! Pipelines were installed, and the sprinkler system established using four inch Pope pipes with a sprinkler on the end. They weighed a ton! A year or two later they increased the mortgage and bought the very lightweight aluminium sprinkler lines. They were so light that when shifting them on a windy day the person doing the job would spin like a helicopter! They went to field days and listened to the Agriculture Department's experts and installed overhead sprays, which made life a lot easier. However, another of the Department's experts warned that the trees would die from salinity burns as the water evaporated. Their fourth system was under tree sprinklers — just one jump behind drippers of today. It was an expensive exercise. They knew that saline water was a problem as when they turned on the pump, the first quarter of an hour of water had to be returned to the flats before sweet water came through the pump. Johnny's brother Lloyd Johnson and his wife had bought a property a couple of blocks away and Lloyd extended the channel to his block of 65 acres and installed a large pump-house and well for the sump, but encountered river sand which destabilised the plant. He fixed this, but it took lots of concrete! As with many early residents around Moorook, diversification was critical to maintaining good cash flow. Johnny prepared a business plan for egg production and built this into a 1000 chook enterprise boxing and delivering eggs to the nearby Yinkanie Railway Station for freight to Adelaide. Returns of up to 20 pounds a week helped the cash flow significantly. The 1960 high river forced the couple out of the tents in which they lived on the riverbank, and they moved into a small shack which Mal had built. Johnny recalled how healthy the floodplain vegetation was, sailing a ten foot dinghy over the floodplain during the 1960 flood, and eating swans eggs during tough times which Mal would harvest from the south lagoon. One batch of swans' eggs they found was almost ready to hatch, and were placed under the hens where a pair made their way into the world and were nurtured at the shack, bonding to their "Mum", Johnny. They grew into fully fledged birds, but Johnny was devastated when they came home from a trip to Adelaide and found both missing. The male bird was found with his wing broken and head missing, the shocked female was unhurt. After a few weeks, with the Lagoon black with wild swans, Johnny thought it was time she went back to her own. Easier said than done. She didn't want to leave her "Mum". Eventually, by hiding from her, "Ethel" as she was called, went to her kin. During Johnny’s early years in New Residence and Moorook she had been filing stories for The Loxton News and in 1963 the owner of the paper, Keith Irving, approached her to become Newspaper Manager. In 1964 following the purchase of the newspaper by The Murray Pioneer, she was appointed Editor of the Loxton News and the increase in off-farm income significantly helped to meet the challenges of developing the farm, so much so, that Johnny closed the egg production business because she couldn’t manage her new job as well as the chooks. In 1965, Johnny and Mal married and lived in the new house they had built on their property. Johnny continued to drive her Morris Minor to and from work through to the early 1970’s and on weekends she worked on the “block”. Christmas time was exceptionally busy with apricot picking and cutting. “Snow" Tschirpig, son of Traugott Tshirpig, lived in the original Tschirpig homestead overlooking the South Lagoon. Johnny recalled conversations with “Snow” who told her that before Lock 3 was built just downstream in 1925, the bed of the north Yatco Lagoon was cropped. This would have been Fred Drogemuller’s work. English friends of Johnny's during her 1959 visit had asked her to look out for some land for them, inspired by the pioneering of the area. She was able to buy 100 acres from "Snow Tschirpig, whose grandparents had pioneered the district. Their block was called "Moorook Estate", and Harry Strangward, who had initiated the arrangement, called one of his racehorses "Moorook" after his South Australian connections. Mal and Johnny installed the irrigation system and planted the first trees. A house was put on the block and a manager installed. When Johnny arranged for the purchase of the 100 acres of Snow Tschirpig's property for the English syndicate, she included an easement from the property to the river. It was called "forward thinking"! There was some bureaucrat questioning about the channel and the easement, but following a submission with an accompanying plan of the proposal, local MP Tom Stott ensured that the matter was passed, as by then other settlers were pumping out of the channel for their properties, and were well established. It would have upset a lot of people if there had been any interference. The easement was a precursor to what is being established today for the settlers involved; pipelines from the river. Johnny’s nephew is Ken Johnson who continues to live and farm at Yatco Lagoon and is one of several irrigator’s whose pumps will be relocated from the channel to the River Murray.